With GPS receivers integrated in phones, tablets and PCs, a lot of apps are being built that displays your current location. Usually the GPS API’s that these devices come with provides you with two values: Longitude and Latitude in decimal degrees, and often an estimated accuracy in meters. Most apps just display these values as is, without considering formatting or number of significant digits. This blog post attempts to show how this could be done. I’ll use C# for this, but it should apply to any device, language and API out there. Some people think of longitude as the “X” in an ordinary flat X,Y the coordinate system and latitude as Y/Up/North. It’s technically not correct because this is not a flat coordinate system, but a ‘polar’ coordinate system - I do however understand this simplification and I think of it the same way internally when working with code that deals with any type of coordinate system. However, how things work internally and how they are displayed are two very different things. An example of this are date objects: They are usually stored and handled as a ‘tick’ number, but we never display it like that. Geographical coordinates are the same way. They have one way they are stored in memory, and a completely different way to be displayed. First of all lets get the order out of the way: If you still think of longitude as the ‘x’ you probably want to display this value first. However it’s commonly agreed upon that latitude is displayed before longitude. char ns = lat < 0 ? 'S' : 'N'; //Southern or Northern hemisphere? char ew = lon < 0 ? 'W' : 'E'; //Eastern or Western hemisphere? Often I see a location displayed as for example -117.342817243 , 34.212381313. When I see this many digits I instantly think ‘oooooh that’s a very accurate location’. But this is very misleading. In college, several of our professors would fail our reports if the end result displayed more digits than the accuracy of the input data. The same thing applies here. 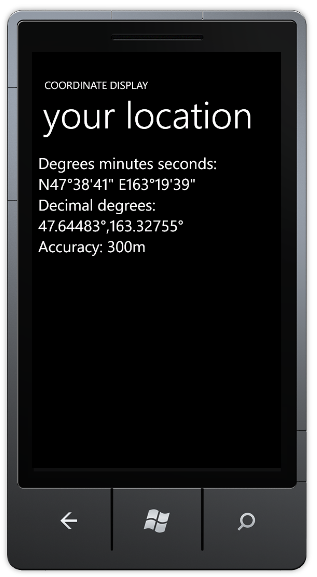 If your GPS receivers accuracy is 1000m, how many digits should you display, and how many meters is one second? For simplicity let's stick with a rough average of 40mio meters, since this is not going to really matter for the end result. So from that we get that we should never display any decimals on seconds unless our accuracy is better than 31 meters. And we shouldn’t display more than one decimal unless the accuracy is 3m or better (which never happens with standard GPS equipment). Similarly if we are using decimal degrees instead of DMS for display, how much does the n'th digit matter at Equator or along a meridian? So in this case we will only show 7 digits if accuracy is better than 40m, and probably never more than 7 digits. Latitude always goes along a meridian, so the number of significant digits doesn't ever change with your location. But the length of one degree at a longitude changes with the latitude you're at. The radius of a longitude at a given latitude is: cos(latitude)*mR*2*PI. At 34 north or south that would be: 33,168,021m. So here the number is roughly 3m instead of 4m, meaning you are more likely to show more digits on the longitude portion for the coordinate, the further north you go. In general practice however, this is not going to matter too much, since it only gets better. so to keep it simple we’ll just stick with the same conversion at all latitudes. So let’s bring all this together into a C# ValueConverter you can use for binding against a GeoCoordinate object returned by the GeoCoordinateWatcher in .NET and Windows Phone. A converter parameter is used for choosing whether you want DMS or decimal degrees as output. You can download this sample app here.